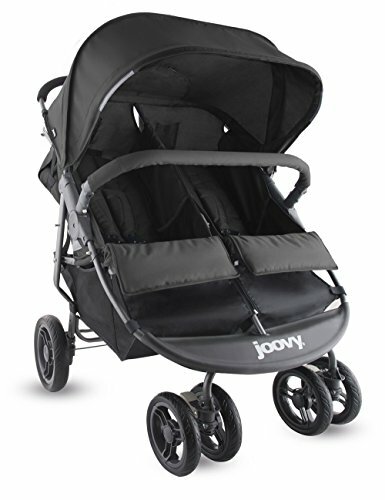 The Joovy ScooterX2 double stroller has a new stylish graphite grey frame and bigger wheels. The larger 7-inch front wheels and 9.5-inch rear wheels make it easier to maneuver than before. Its lightweight and narrow design allows the stroller to fit through any door while providing ample room for your kids. The width of the stroller is 30 inches, so there's no need to fold it to get inside a door. The wheels have sealed bearings so pushing two kids totaling 90 pounds is easier than you could imagine; and, the double front wheels make the stroller extremely stable. This is especially important if your kids climb in and out of the stroller by themselves. (We have included a removable bumper bar to eliminate this possibility too!) The basket is bigger than any stroller basket on the market, period. The canopy is bigger than any other stroller on the market, too. Each seat is fully adjustable, independent of the other, and each has its own in-seat mesh pocket and adjustable 5-point harness. You will love the one-hand recline system that locks into an infinite number of positions - all the way down to a near flat napping position. We have also included two cup holders for the parents and two zippered pockets for phones, wallets, snacks, etc. Folding takes just seconds with the one hand fold feature. The Scooter X2 gives you the features you demand, the fashion you expect and the quality Joovy is known for - all at a reasonable price.